Richard Irwin (Belper, United Kingdom) on 27 February 2008 in Lifestyle & Culture and Portfolio. This is my final shot of this Yegen series for now. I really liked the white cat against the shadow, the black cat against the light, a kind of 'YIN-YANG' of cats. I will post some more images of Yegen in the future. I will return there one day, it would be interesting to see how much has changed. That is what i call the perfect shot! It is as though the cats posed for you. You have made Henri Cartier-Bresson proud. Very nice B&W. I hope the cats have a home. From a cat lovers heart. What a composition! Well done. Superb! The lighting is terrific and the vision to see this shot is really excellent. Very impressive as usual. A very interesting shot. This lighting is wonderful, and I totally agree with your assessment of the cats. Richard, this is awesome. What an artistic shot. Superb. I love that its in B & W. Simply breathtaking. Congrats! A beautiful ending to a wonderfully rich story! A fantastic image, brilliantly captured. A fitting shot to the end of a wonderful series. Beautiful shot! i really like the cats in this picture. wow what a composition.. just superb. i don't like cats, but this is a stunner. Oh Richard, I looove this shot!! I almost missed the cat in the back because the cat in the front is sooo powerful. Great capture!! Hope you are doing well! 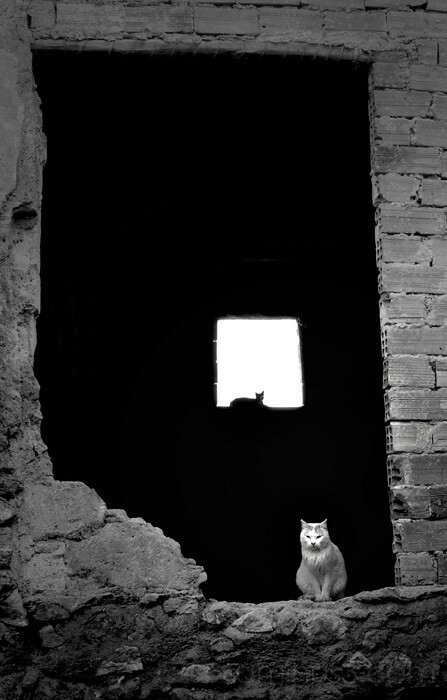 great photo, the light the dark and each with its own cat. This is fantastic Richard ! As you said the contrast between cats and light and between cats themselves is just great. The framing is also very cool. Hey Richard! This is really a wonderful composition! Just excellent! What an excellent capture - you have a great eye for composition. The ligths the tones and the cats are all perfect! I have to say that of all your Yegen series this is my favourite but the laughing woman a very very close second. This one is just so fantastic on all levels. @amy: Thanks Amy, this shot is also my favorite, which is why I posted it last. A great composition!! !A favourite with me!